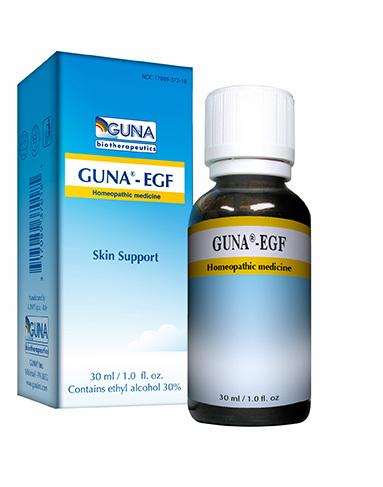 GUNA EGF contains the cytokine, epidermal growth factor (EGF) 4c and 30% ethyl alcohol. This homeopathic product has not been evaluated by the Food and Drug Administration for safety or efficacy. The FDA is not aware of scientific evidence to support homeopathy as effective. Since we do not know everything about your medical history.cations, please consult with your health care practitioner before implementing any new protocols and supplements. Do not construe any information listed on this site as a substitute for actual medical advice. The info you receive from us is not intended to replace medical advice by your doctor. We do not dispense medical advice, prescribe, or diagnose illness. Adults and children 12 yrs and older: 20 drops twice a day in a little water. Hold in the mouth for about 30 seconds then swallow. Children 6yrs to 12yrs: 10 drops twice a day in a little water. Hold in the mouth for about 30 second then swallow. Children under 6yrs: 5 drops twice a day in a glass of water. Help for itchy, red skin. The MSM way to cleaner skin.